Music has been a staple of human culture since before the implementation of language; it is our oldest form of communication. As the species made advances in technology, so did the processes for making and storing instruments also evolve. Ancient instruments were made with the tools and materials available; wood, metal, a pick, etc. They were simpler in design, more difficult to tune and significantly less durable. Contemporary instruments, made of metal, wood, and synthetic materials, share most of the same characteristics as their ancestors. Methods for long-term storage and maintenance have also been developed (cases, swabs, polishing cloth, etc) to help protect the instruments. This article will focus on three of the oldest instruments still in use today; the flute, drum, and members of the string family. According to a study by James Owen for National Geographic News, flute-like artifacts dating back 40,000 years were discovered in 2008 in Germany. They are currently on display at the Smithsonian Museum of Natural History in Washington D.C. These are likely the oldest man-made instruments in existence today. 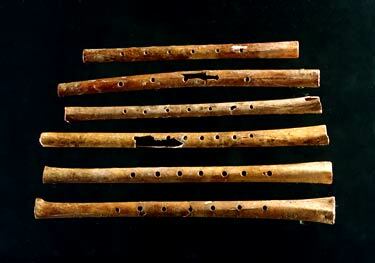 Ancient flutes were made of bone or wood, generally from a naturally hollow cylinder (like a vulture bone). Hollowing out a flute by hand would have taken an immense amount of technical skill since the only tools available were rudimentary picks or knives. Because the instruments consisted of natural materials like bone, the measurements, tone quality, and pitches were unique to each instrument. The majority of remaining artifacts are broken or damaged due to the fact that there were no methods for cleaning or storing these instruments. Modern flutes are made of silver or silver-plated metals and “pads” made of synthetic skins or felt to help the keys seal. While many professionals opt for a custom instrument, the majority of student flutes consist of pieces forged by machines and are hand-assembled. This process ensures that each flute is exactly the same size and shape. The instrument consists of sixteen tone holes, is easily tuned, and breaks into three pieces (head joint, body, foot joint) for easier maintenance and storage. Flute owners now have a wide selection of synthetic cases and cleaning options to choose from to preserve their instrument. These items are generally mass produced in factories from synthetic materials and then shipped to buyers around the world. Drums are widely considered to be man’s oldest instrument, after the voice, dating back to the Prehistoric Era. Throughout human history, several civilizations used the drum in religious ceremonies or as a method of communication. The instruments were originally made of hollow tree trunks or clay pottery with animal skin stretched over the top, but as humans began to experiment with various metals (most notably bronze c.3000 BCE), the materials were incorporated into percussion instruments also. Because all percussion instruments were handmade, the pitch and tone quality varied greatly. Although methods of cleaning and storage were virtually non-existent, several artifacts remain intact due to the sturdy nature of their materials. Currently, there are over one hundred different types of drums in use around the world. For the purposes of this article we will explore the characteristics of the contemporary concert snare drum. Snare drum heads are available in either plastic or calfskin and have an average diameter of fourteen inches. The shell is constructed of metal, wood, or a synthetic material. The drum itself is generally only four or five inches deep with metal wires (snares) on the bottom. Sound is produced by striking the drumhead (or rim) with a pair of wooden or synthetic drum sticks. Contemporary snare drums can be tuned by adjusting the many screws along the edges of the drumhead. Drum maintenance includes regularly oiling the moving parts of the instrument, tightening all loose pieces, and proper storage. The majority of modern snare drums and accessories are assembled in factories and shipped to distributors worldwide. According to Mark Cartwright of the Ancient History Encyclopedia, Archeologists have found evidence of stringed instruments dating back to 100 BCE. Ancient Greeks used these instruments for religious ceremonies, festivals, and storytelling. Musicians “enjoyed special status” in high society and had several opportunities to travel. Lyres in Ancient Greece were constructed of wooden frames and seven strings (made of animal gut) with either a wooden or bone tuning peg. The instrument was played by strumming or plucking the strings with the hand. There was no storage or repair method to preserve ancient string instruments, however, music in Greece was well documented in both written history and art. While the lyre is no longer commonplace, most cultures currently include a violin or harp in their musical performances. The construction process for modern string instruments involves handcrafting and assembling a multitude of pieces and takes several months to complete. The modern bow, believed to be the ancestor of the hunting bow, is composed of fiberglass or graphite and synthetic hair. To produce a sound, musicians must pluck or bow the strings. Preservation processes include regularly applying rosin to the bow strings, polishing the body of the instrument, and proper climate-controlled storage. Very few 21st century string instruments can be broken down into smaller pieces, but instead are placed into cases of equal size and shape for storage. The cases, constructed in factories, are comprised of leather or plastic with metal clasps and a padded interior. Larger string instrument cases even have wheels (not seen in human culture until 3500 B.C.) on the bottom for easy transportation. Humans’ increased mastery of tools and the Industrial Age has altered the way we develop, care for, and use musical instruments. Music’s role in society, however, has not been diminished. Cultures around the world continue to employ instruments in daily life, celebrations, and religious ceremonies; as technology continues to evolve, so will musical instruments. Look for ancient musical instruments in museums like the Smithsonian Museum of Natural History in Washington D.C. (http://naturalhistory.si.edu) or the Musical Instruments Museum in Brussels (http://www.mim.be/en). Hall. Pearson Education Inc. New Jersey. 2011. Pages 260-286. 07 May 2017.
of Physics. 18 October 2012. Web. 07 May 2017. “The History of the Drum – Early History.” Make Drums. N.p. N. d. Web. 07 May 2017. “The Revolutionary Invention of the Wheel.” Ancient Origins. 2 June 2014. Web. 08 May 2017. “Musical Instruments of the Ancient Greeks.” LyrAvlos. Centre of Greek Musical Tradition. N.p. N.
“String Instruments.” Medieval Life and Times. N. p. N. d. Web. 06 May 2017. “Flute.” Mostly Wind. N.p. 05 December 2011. Web. 07 May 2017. “Lyre.” Cartwright, Mark. Ancient History Encyclopedia. 16 December 2012. Web. 06 May 2017. Wood, Alastair. ClassicFM. 31 May 2016. Web. 07 May 2017.